Your order will ship MONDAY if placed in the next 20 hours 55 minutes . Enter your shipping address zip code to receive an instant delivery date estimate from UPS. Federal American Eagle 5.56mm NATO Ammo 62 Grain Green Tip Penetrator 1000 Rounds Bulk ammo for sale online at cheap discount prices with free shipping available on bulk 5.56mm NATO ammunition only at our online store TargetSportsUSA.com. Target Sports USA carries the entire line of Federal ammunition for sale online with free shipping on bulk ammo including this Federal American Eagle 5.56mm NATO Ammo 62 Grain Green Tip Penetrator 1000 Rounds Bulk. Federal American Eagle 5.56mm NATO Ammo 62 Grain Green Tip Penetrator 1000 Rounds Bulk ammo review offers the following information; For nearly a century Federal Ammunition has put its focus on manufacturing quality products with cutting edge technology. This dedication to excellence has given Federal a competitive edge as an ammunition technology giant. 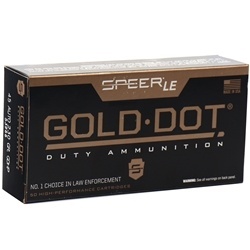 Today the company is well known for producing high grade centerfire, rimfire, and shotshell ammunition that shooters everywhere know and trust. Made by Lake City Ammunition Plant LCAP, the 62 grain Green tip Penetrator 5.56mm ammo features a 62 grain steel core full metal jacket bullet, brand new never fired virgin brass casing that is annealed for lower expansion purposes, can be reloaded up to seven times for those shooters that reload their 5.56mm ammunition, and a non corrosive primer. Currently used my the United States military, this is the best 5.56mm ammunition on the market. Federal Lake City XM855 ammo can be used for target & practice shooting, sport shooting, small-game hunting, law enforcement and etc. This Federal 5.56mm ammo load is packaged 1000 rounds bulk loose in a box. Federal Lake City 5.56mm Green Tip ammo offers a muzzle velocity of 3025 feet per second and muzzle energy of 1326 ft. lbs. Federal XM855 5.56mm NATO ammunition is loaded to Military specification at the Lake City facility. This particular load uses the XM855 bullet which is a 62 grain Green Tip Steel Penetrator. The finished rounds consist of sealed primers which is ideal for long term storage and moisture protection. Federal Lake City Green Tip bulk ammo for sale with Free Shipping. Federal SS109 ammo is currently used by the United States Military for combat. Cheapest price I’ve found on quality Federal American Eagle bulk ammo with free shipping included. 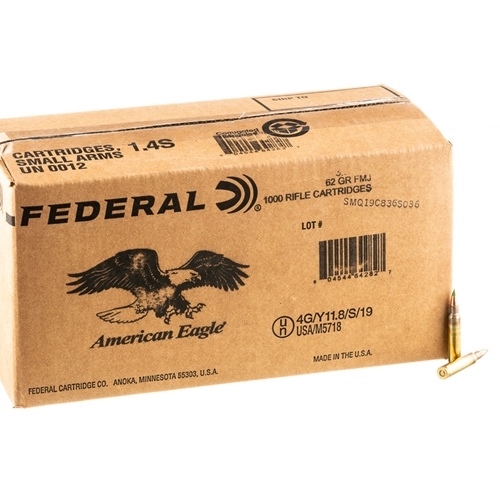 Great price from Target Sports for Federal American Eagle Ammo! This seems to be the same ammunition I qualified with when I was in the Army Reserve. It is Federal 62 grain 5.56 mm NATO steel penetrator ammunition. I don't mind it coming in a loose pack, saves time unpacking it from the individual boxes. As far as accuracy it seems to be as accurate as the ammo I qualified with which was accurate enough for its intended purpose. I have yet to have any types of failures with this ammunition. I'll use about 200 rounds to plink and practice with and the rest I will stagger in magazines along with hollow point and ballistic tip ammo. Add to that the fact that I paid what you would pay for steel ammunition and that was a great deal. Response:Hi Marcin, we will get more XM855CSF back in stock in about 2-3 weeks. However we have more of the same product in stock at the same price under this SKU: XM855BK150. Packaging is also better. Response:Hi Steve, the production year of this Federal American Eagle 5.56mm NATO Ammo 62 Grain Green Tip Penetrator 1000 Rounds Bulk ammo is 2018, however they are not vacuum sealed, just loose placed in ammo can. Response:Good Afternoon Juan. Thank you for your inquiry. For a list of participating vendors on our website, please click on the following link https://www.targetsportsusa.com/dealers.aspx The majority of participating vendors are indeed charging a transfer fee of some sort. We do sincerely apologize for the inconvenience of this. We hope that you still will continue to do business with us in the future.